Car windows and windshields are things that many drivers just don’t think much about– until one day they suddenly need to be replaced. Maybe it’s a large chip, or a small crack that has since flourished over time into a web of other cracks. Perhaps it was a single incident of blunt force that smashed the windshield in seconds. 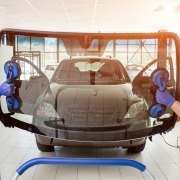 Regardless of what it looks like or how it happened, the truth is that any damage to car windows and particularly windshields should be repaired as soon as possible. But since this is not something drivers actively think about, it can be difficult to find the best place to go for this service. Many people are quick to search “Windshield Replacement Near Me”, but clicking on the first result that pops up is not always the best choice. Not only is driving with a damaged windshield incredibly dangerous in terms of being able to see everything on the road, but drivers in Arizona can also accrue hefty fines if they are caught driving with any windshield damage that is more than 1/4 of an inch (based on Federal regulations). Even if you do not think that the crack or chip is obstructing your view, the decision is up to the discretion of any law enforcement official who may pull you over. Even though small chips may be able to be repaired if addressed quickly, there is still the risk that they can result in blurry spots that can be distracting. Replacing the entire windshield is always the best course of action. Because windshield replacement is so important, there are actually a lot of different types of places that offer this service. From car mechanics to general glass workers to auto glass experts, it is important to make the right decision after searching for “windshield replacement near me”. Before making any final decisions, it is important to make sure that the service you choose is state certified and has years of experience, as well as insurance for their company and service workers. It is also important to consider the fact that cheaper isn’t always the better option, especially when it comes to quality and experience. Furthermore, the truth is that you do not actually need to go anywhere at all in order to get your windshield replaced. Instead, an auto glass service like Freedom Auto Glass will not only come to your location to perform the job, but is also available 24 hours a day, seven days a week. Freedom Auto Glass has been helping clients across the Phoenix region with windshield replacement for years. Customers can either call or use the online scheduler to book appointments, and as a mobile service provider we are always happy to come to you. And unlike many other auto glass workers, we are happy to help you directly file a claim with your insurance company. At Freedom Auto Glass, we also pride ourselves in offering the best prices around, and if you find a better one that can be verified, we will match it. When searching “Windshield Replacement Near Me”, choose Freedom Auto Glass! At Freedom, customer satisfaction is given priority and hence we strive to provide the highest quality service every single time. We work hard to make your experience with Freedom the best. We handle all automobile glass replacement and repairs.